Double click to add a note. I hope you have a great experience in California. Please do your best to document your learning and share the experience. 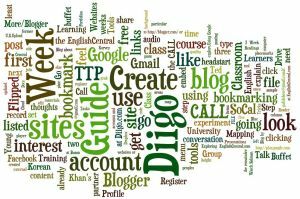 Use Diigo and your blog to bookmark and share useful sites and resources. Photos can be shared in the Facebook Group or by using Google Photos. Download a presentation from Slideshare or embed one on your blog? Create a VoiceThread and post it on your blog? Create a Prezi and post it on your blog? Post to the 3+3 Facebook Group? Record and edit a piece of audio as an mp3 file and post it on your blog? Add a placemark to a Google Map? Embed a Google Map on your blog? Jeff, I'm thrilled to find out my blog was mentioned here. My fatigue just went away after seeing my Korean name here. You've inspired me a lot with your Call class and are still giving me the encouragement with which I can go on. Thanks a million!! Although the training course had been finished, my Call class with you never ends. ...and I am thrilled to see you putting so many CALL tools to use 'on the front lines'. Thank you for providing such a great example of how to use CALL in the real world. I would love to have you as a guest presenter sometime in CALL class - perhaps via a live or recorded Hangout. Keep up the great work. I'm very tuned in and look forward to connecting soon.